Sitting in the lap of the Karnala bird sanctuary and just over an hour outside Mumbai, you can't go wrong with BRT Karnala for your camp out. 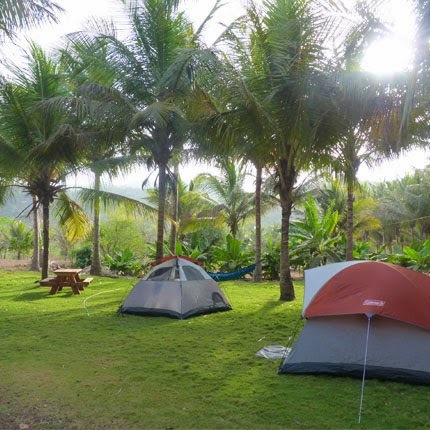 With lush lawn and palm trees the ambiance is contagious, and you will naturally just take off on a jaunt towards one of the pathways leading out of camp. Coming to camp at Karnala, there's so much to explore yet ample time to laze. The challenge then is to slow down! Its not often that we experiment with our vacations, but here we encourage it. From living in tents, building a campfire, grilling your dinner or a sleepy afternoon in a hammock, once you have enjoyed camping, you will want to introduce others to the idea. It is what "Happy Campers" do! A day at the campground is simple, but a walk or yoga in the morning, pitching your tent on time just before sundown and firing up your barbecue grill and campfires just after the sun sets is the discipline of camping. Imagine the crackling of burning wood followed by an even yellow glow across the campground in the evening. This is the pride of camping. 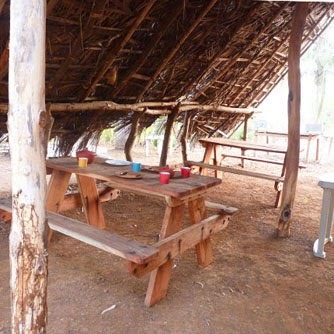 We have just a few sites at this campground well lit and spread out with all the amenities that you would expect. At our campground, we promise an ambiance and we provide an experience. Our common areas have some games to take you late into the night! But there's nothing like spending a couple of hours in a hammock with that book that you never got down to reading..
Showers and WCs are common to campers. These are maintained clean with ample changing space. 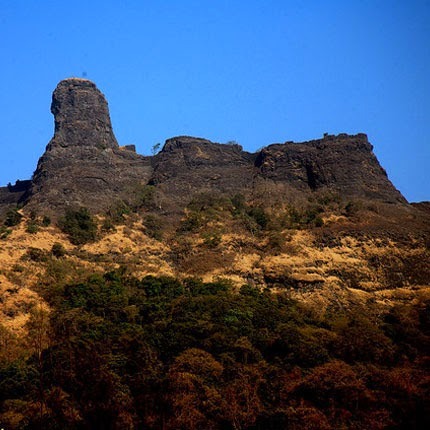 Picture of Karnala Fort; short drive away from campsite..
Coming camping to Panvel is an easy decision for all us weary city dwellers. Nestled just a few minutes drive from the Karnala Bird Sanctuary, you should plan to take a trip down there, not so much for the bird sounds but for the solitude that the few trails offer. Hiking and trails In the monsoons and winters, a hike to the Karnala Bird Sanctuary is a must for the adventurer in you. It takes under 2 to 3 hours to get to the fort, through a relatively simple self-guided trail. We are located in the midst of our own little secret of nature and the hosts will take you for a guided night hike around the space. If you are into it, a pre-planned 1 hour walk to a nearby fishing village followed by a boat ride and/or a dip in the lake can be arranged! Monsoon Magic The monsoons bring alive a waterfall through a trail leading from the campground which an absolute must-visit! The trails turn green and are simply irresistible. For the kids Garden sprinklers bring out the smells of earth during the hot afternoons while sky watching sessions in the winter nights are a real treat! Kids can also plan an educational visit to the Yusuf Meherally Center to see some cottage industries. There are at least three meals that you need to plan for your stay at our camping ground at Karnala. While a simple breakfast fare is offered, you will want to plan lunch, dinner and an evening snack. Your own barbecue meal. Recipes are here Veg BBQ Ideas & Non-Veg BBQ Ideas. We have bbq grills and ice boxes so you can store your BBQ for an evening barbecue Cookout. Guests have made great meals at the campground. With a little effort this can be the highlight of your trip! Ask us for a stove (Rs.100 for a meal) if you want to cook. We will help you however we can! This winter we promises to deliver the camping experience with just a little added amenity. You can enjoy a close connect with the outdoors with us the winter with campfires, barbecues and an ambiance that you have come to love!! Camping Charges Adults Rs.1600 (per person) per night. Rs.1000 each for children under 8 yrs. Overnight Camping: A night of camping has a check-in time of 3pm and a checkout time of 11:00am. You can request a late checkout and we will be very happy to oblige if we have room. We also include breakfast on the 2nd Day in our pricing. *We provide discounts of Rs. 100 per person for your own tent and 100 per head for your own sleeping bag! Please call / SMS +91 9619182010 (email asif@natureknights.net ) for booking and queries. We require prior booking and payment to help us plan to service you. 2. Please drive at max 5km/hr in and around the campground premises. 3. Our timings are: Check-in between 3pm and 8pm & Check-out by 10:30am the next day for a night of camping. We enjoy your company at the campground and we don't have very strict check-out timing rules. All the same, if we need to allot the site to guests coming post checkout time we will request you to vacate. 9. Please leave the Tents pitched and the sleeping bags in the tents for our checkout procedure. Please ensure that you return all rental items before leaving the campground and leave your campsite neat and tidy. 11. Trek/ Bullock rides or any other easy adventure activities are available at extra cost. Do you have sites so a group can camp together? Do you offer any discounts for booking the entire campground?